AIOTI announced its joint 5GIA-AIOTI Vision on Future Networks, Services and Applications in a press release here. The vision document is entitled: “High societal and economic impact for potentials for a collaborative approach in the Horizon Europe Programme.” This marks the first important milestone on the road to the EU partnership under Horizon Europe. The full document can be found here. Each two years AIOTI is electing its leadership. This year 3 Management Board positions are available for a two-year term. Candidates for a board seat should send their name, contact details, CV and photo, together with maximum 160 words to the Secretary General at sg@aioti.eu by 26.04, 12:00h CET. The Secretary General will collect all nominations and present them to the Management Board ahead of the electronic vote that will be held during the General Assembly on 21 June in Aarhus, Denmark. For more information or questions about the board positions, please ask the Secretary General at sg@aioti.eu. In April, AIOTI will also launch a Call for Nomination for AIOTI Working Group Chairs. More information to follow. At the end of March, AIOTI has 169 members. 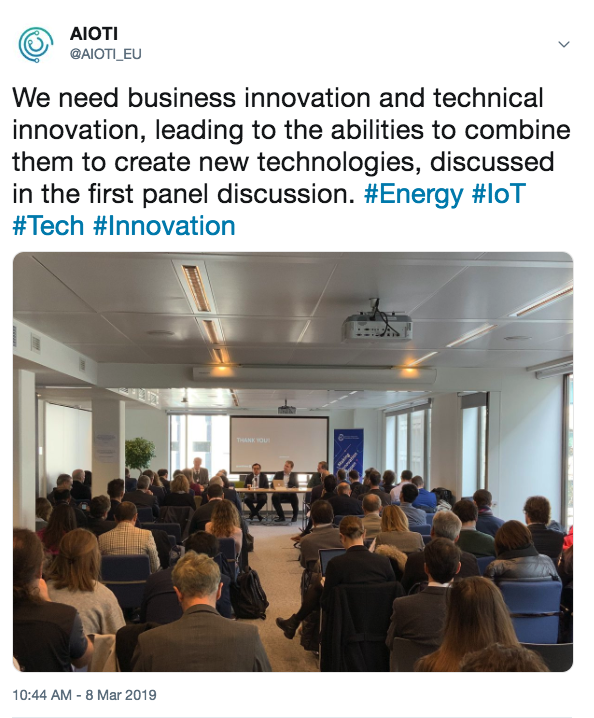 The workshop is co-designing benefits form a European IoT DIH network and is collocated to Open Energy Marketplaces and the enabling technologies, that was jointly organised by DG Connect, DG Energy, AIOTI, ENTSO-E, KIc Inoenergy and ETIP-SNET on 8 March in Brussels. More details can be found on the AIOTI website. This workshop was organised by ETIP SNET with many EU platforms, PPs and other EU initiatives in order to debate about ETIP SNET Vision. 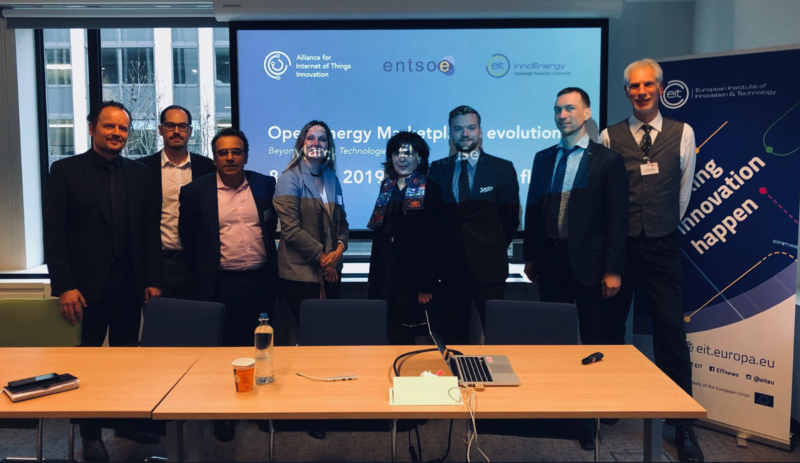 Natalie Samovich, AIOTI Chair of WG on Smart Energy, presented the view of AIOTI and energy during the workshop. More information could be found here. 21 June 2019, Aarhus, DenmarkThis year we will again collocate the General Assembly with IoT week in Aarhus. The GA will be held on Friday, 21 June in Aarhus, ARoS Art Museum. Regarding the AIOTI members who want to attend the IoT Week, they will benefit from a discount when they register via the link above and enter the following Promotional Code: AIOTImember2019! Following the IFIP 2018 Conference that took place in Poznan, Poland in September 2018, AIOTI Chair Kees van der Klauw contributed to their book on the Internet of Things and Information Processing. His contribution to the book can be found on page 37-49 here. Kees van der Klauw, AIOTI MB Chair, contributed to the March Issue of the European Files Magazine on “Guaranteeing Cybersecurity in Europe: Ambitions for a European Cyberspace.” His article is entitled “Multi Stakeholder Participation to Lead European Researh and Innovation for Cybersecurity” can be found here. 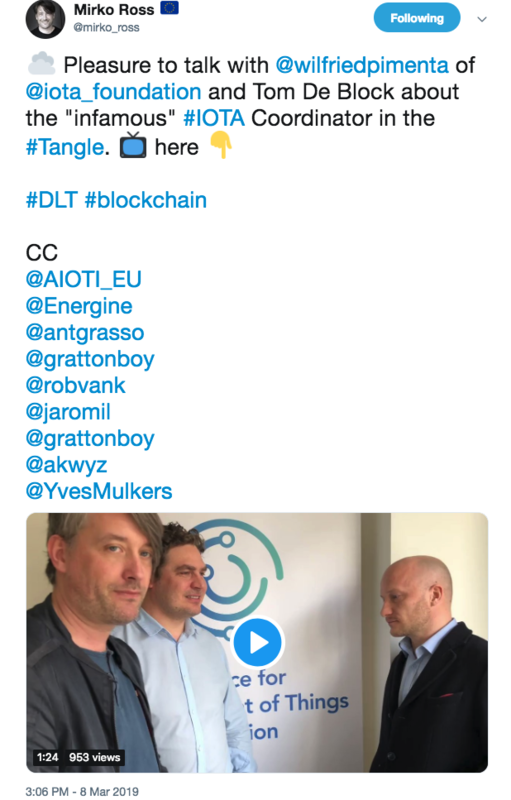 Omar Elloumi, Chair, Smart Cities, AIOTI; Tom De Block, Chair, Distributed Ledger Technologies, AIOTI; Natalie Samovich, Chair, Smart Energy, AIOTI co-drafted the article. The full blog post can be read here. We would like to inform you that CECE published the Final Report of the CECE Digitalisation Project is on their website; it is now available for consultation and download. In February 2018, a consulting team had been tasked with this research, looking at the digitalisation process in the construction value-chain, from the perspective of machinery manufacturers. The project involved multiple data collection tools inserted in a phased methodology: desk research, online questionnaire, expert interviews & case studies. The project was managed by a Steering Committee, which – as part of the value-chain approach – involved representatives of European construction contractors (FIEC) and equipment rental companies (ERA). 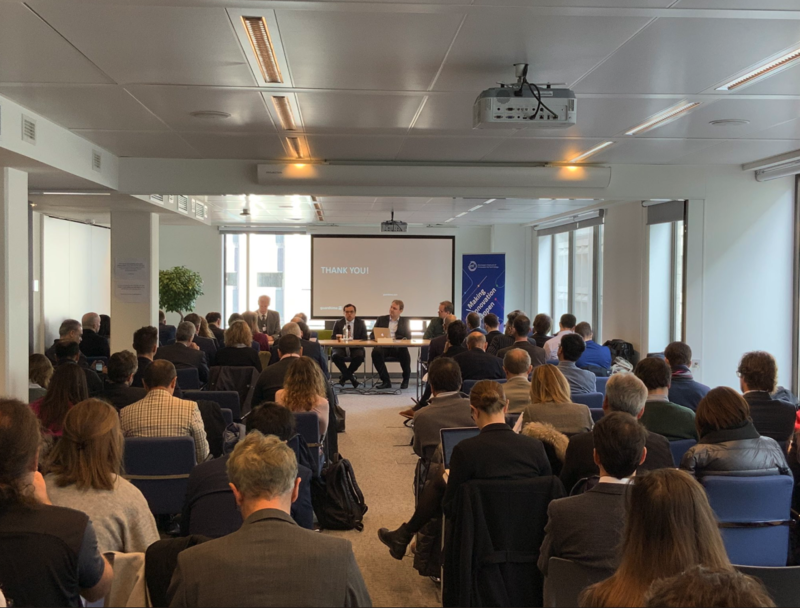 On 22 March 2019, ARTEMIS Industry Association released the results of a study into the economic and technical outlook for Embedded Intelligence. Conducted by independent consultant Advancy, this report analyses the EU’s Electronic Components and Systems value chain through a global lens. In doing so, it identifies areas in which further R&D&I investments will be vital in consolidating Europe’s lead or in catching up with other international powerhouses. Currently, the EU is being outspent by the US, China, Japan and (in relation to GDP) South Korea. See the AIOTI Calendar of Meetings here. report highlights several IoT vertical domain use cases collected by AIOTI (Alliance for IoT Innovation) and determines the specific requirements they impose on the underlying network infrastructure. These use cases and requirements can be used by SDOs (Standards Developing Organizations), such as 3GPP (3rd Generation Partnership Project), ITU-T and IEEE as requirements for automation in vertical domains focusing on critical communications. The full report can be read here. AIOTI is proud to announce that, since the launch of its Linkedin group, we know have 300+ members. In case you haven’t done so already, please join our Linkedin group here! Linkedin connections have increased to over 900 connections (compared to 750 in February). 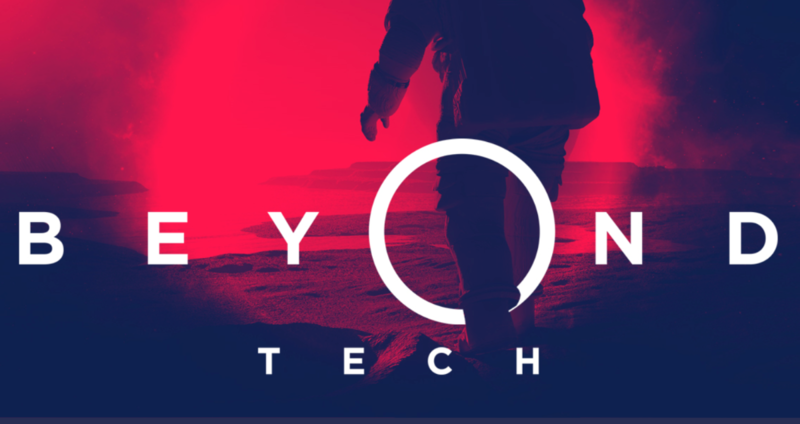 You can also connect with us on Linkedin here.